We recently had the chance to review some really neat products that can be made out of your child's artwork from PrintArtKids. 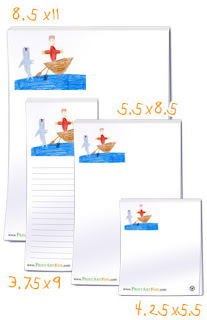 "Your kids will be thrilled to see their “masterpieces” reproduced on Notepads, Note Cards, Notebooks and Return Address Labels. Imagine their excitement at seeing their own artwork featured on Invitations and Thank-You Notes! Use your own artwork or favorite photographs from your kids’ sporting events, family vacations or other special occasions to create one-of-a-kind treasures. Whether you’re a saver and keep everything, or prefer to keep only a few special pieces, don’t let your kid’s artistic efforts go unnoticed. Preserve those cherished pieces and let turn them into items that you, your friends and family will use and enjoy every day. PrintArtKids will transform your kid’s vibrant flower painting into Notepads, handy for writing notes to teachers or for making to-do lists. The favorite Christmas ornament that your son made in 3rd grade can be made into this year’s Holiday Card. 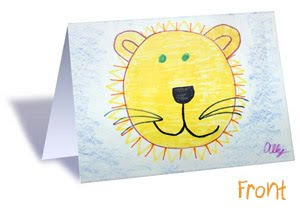 Your daughter’s finger painting from kindergarten can become a one-of-a-kind Note Card. Imagine the excitement and pride your children will feel when seeing their artwork celebrated and enjoyed by family and friends! products make great gifts for grandparents, teachers, friends, aunts, uncles, moms and dads. Best of all, these products can be used again and again throughout the year. In addition to Notepads and Note Cards, your child’s art (or your own artwork or favorite photographs) can be used to create Notebooks, Journals, Invitations, Thank-You Notes, Birthday Cards, Holiday Cards, Postcards from camp, and Cards for just about any occasion. PrintArtKids uses recycled paper and earth-friendly materials in the production of our products. We take pride in doing our part to preserve the environment for our kids." What we thought: I absolutely LOVE this idea! In my eyes, almost every piece of art my 2 kiddos produce is a "keeper." However, we do A LOT of art. Our fridge is always covered, the kid's each have art in the bedrooms, we give a ton away to relatives that appreciate a piece or two and we still have boxes and boxes of artwork saved...my kids are only 4 and 2. I can only imagine how quickly these projects will add up once they are in school and that leads me to wonder how we will all swim out of the masterpieces in a few short years:) The solution: PrintArtKids! These products are awesome! I am pretty impressed by the variety of things you can put your children's artwork on...and these are all wonderful useful things that you can share with friends and family! I love the idea of putting a piece of Christmas themed art on an address label for all of our Christmas cards...what a neat idea to include the kiddos in this timeless tradition! I also think the idea of birthday invitations that your child created would be a super unique and unexpected treat:) All of the samples we reviewed were printed clearly on quality paper and card stock. These would make really great gifts for grandparents, moms, dads, aunts, uncles, even the kiddos! ABCD Diaries gives PrintArtKids and A+! Buy It: Find super cool personalized gifts at PrintArtKids! Disclosure: ABCD Diaries was given a sample pack of material for review purposes only. We were in no other way compensated. The opinions expressed in this post are ours and ours alone.